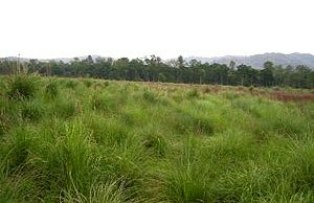 The savannahs do not represent a climax stage in the park but have developed only due to disturbance of the natural flora. Grasses such as Themeda arundinacea, T. villosa, Apluda mutica, Desmostachya bipinnata, Phragmites karka, Cympopogon flexuosus, Digitaria spp., Eragrostis japonica, E. tennella, #Eulaliopsis binata, Heteropogon contortus, Setaria spp. and Vetiveria zizanioides characterize the grasslands. The grasslands are interspersed with some trees and shrubs such as Butea monosperma,. Bombax ceiba,#Acacia catechu, Dalbergia sissoo, #Mitragyna parvifolia, Syzygium cumini, Colotropis procera, #Helicteres isora, Carissa opaca, Zizyphus xylopyra and Woodfordia fruticosa. The commom bamboo Dendrocalamus strictus forms gregarious patches at many places in the park. The association of the Acacia-Dalbergia community occurs mainly in the form of pure patches in some parts of the park. The undergrowth of this type is thin and consists of species such as Lantana camara, #Adhatoda zeylanica, Murraya koenigii, #Zizyphus spp., #Clerodendron viscosum, Cassia tora and C.occidentalis.